This evening, even though Dave is still up, it is quiet in the house. Dave is re-loading software onto his computer after his hard drive was replaced. I have finally stopped working while simultaneously watching TV and checking Facebook, and now I am sitting quietly on the couch with the fireplace burning and the smell of candle fragrance wafting in the air. This day was nothing special. As a matter of fact, I wasted too much time today and didn't get accomplished what I wanted to. But tonight, sitting here peacefully in the quiet, I am thankful. Today I started taking down the autumn decor and began cleaning and preparing to put up the Christmas decor. Not that long ago, this phase of my seasonal decorating used to drive Dave nuts! Today he took it all in stride, knowing that the Christmas "stuff" would soon be brought up and temporarily the house will be in shambles with boxes everywhere. But in the end our house looks festive and we can relax and enjoy it for a few weeks until it's time to take it all down again. We are both looking forward to our son and his family coming when we can both get our hands on our grand-daughter.......ohhhhh, she's so cute! In the meantime, I am already thinking about what tablescape I want to create for the Christmas holidays, so I just may have to try a few out on you and let you pick which one makes it for our family get-together table. Stay tuned for pictures and I hope you comment to tell me which one's you like. I'm open for suggestions!! Post thanksgiving... I am seriously thankful that the scales only moved a few notches. Today is the day that 14 of us gathered around my brother's table to share a meal that made us all hurt, but still want more. I love Thanksgiving.Yes, I love all the foods that I can indulge in and not feel guilty because it's only once a year, but most of all I love the family and friends that gather together with much talk, jesting and laughter. The babies are underfoot, folks are in each other's way and EVERYONE hovers in the kitchen until finally the food is pronounced "ready" and we all sit down to eat.Then afterwards when none of us can move, we all just sit together and savor each other's presence. I am thankful to be blessed to have bountiful food, a warm house to live in and family and friends close by. Warm fuzzy feelings....priceless. I know it has been quite a while since I shared a tablescape. Some of you have gently hinted it was time for another one. Since I quit work in April my life has been nothing less than random as I have tried to figure out how to get things done and start a new business. I've had not much success in either department. 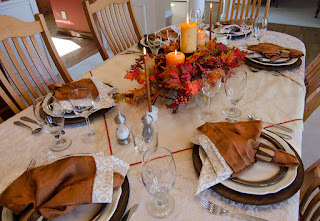 And believe it or not, I (who always has a table on) went months without a tablescape on my table. It wasn't that I didn't get pictures, I had instead papers and a computer on the dining table...something I NEVER do! My Daddy and sister came up today to spend the night before our big Thanksgiving feast tomorrow with the extended family. We will have my oldest brother and half of his family, our daughter and new son-in-law, my Dad and sister and a good friend of my nephew. My brother and I take turns hosting the holidays. This year the dinner will be held at my brothers house and I'll host Christmas. Next year we'll switch. For the past year my dad has been talking about possibly moving up near us, he lives 3 hours south of here! So today I drove him and my sister around a few areas not too far from where we live, a little out in the country, but close enough to all the good shopping. I am cautiously hoping that he is serious as my brother and I would both be thrilled to have them nearer. Momma has been gone for over eight years now, so it seems even tougher with Daddy so far away. It is the night before Thanksgiving and there are no smells of baking, our first empty nest holiday with not even a pie in the making. Our children are in their own homes all nestled in their beds, with visions of their own traditions swirling round in their heads. Their papa and I are exploring new ground, we're not used to our children not being around. Tomorrow will bring football and a turkey still the same, but not much else exciting will happen besides the game. I expect we'll jump at the ring of our cells, expectations of their voices make our hearts swell. It's bittersweet this time, this year...but we anticipate not too long and we'll all once again be near. Until then we'll make it through all right, Happy Thanksgiving to all, and to all a good night. Thanksgiving is this week! This year has gone by so fast and so many things have happened that has changed my normal, comfortable routine. I honestly thought that when I quit my corporate job that seemed to hinder me from accomplishing the many things I wanted to do, that I would have so much free time on my hands. I didn't realize that the very mundane routine of my daily corporate job was actually what allowed me to accomplish what I did in the short hours I actually had at home. Now that I don't have a true routine, I find myself working all kinds of hours and I seem to be incapable of accomplishing the projects and normal social tasks, like sending cards on birthdays, thank you cards and sympathy cards, with any type of expediency. I guess my 30 days will trickle into December. The last two nights I've been so tired that I have fallen asleep on the couch before I've loaded up my computer. I'm hoping I'm past the exhausted phase of my cold and will now be able to not be so tired at the end of a day. Of course I suppose I could also write my thanks at an earlier time in the day as well. But I generally wait until I get quiet and reflect back on my day before I write. Today I demo'd Partylite for my daughter and her guest. Her apartment smelled wonderful once I lit all the candles, then she streamed in a fireplace from Netflix on their big TV and played instrumental Christmas music from the CD Comfort and Joy. The demonstration didn't last that long, but the guest lingered. I would have to contribute that to the inviting and cozy atmosphere she created. I have a friend (Hi Babs!) who is just as weird as I am when it comes to organization. She and I have had "meetings" for years now where we share our organizational spreadsheets with each other and hold each other accountable to getting our tasks done. Babs and I don't live in the same state, so we actually schedule our time to call each other on our spreadsheets too. One more task we can check off our list, check! Through the years we have changed and tweaked our spreadsheets to make them work for us, and for many of those years, these spreadsheets have made us both well oiled, task completing machines. That is until life changed for both of us. Bab's took a new position with the company and I left the company. Life changed for us and , well, neither one of us acclimated very well to those changes. We found ourselves no longer getting much accomplished, which for org freaks like us, is very disconcerting. Call me nuts, but once I get past the fact that warm weather is finished for the year, I embrace the colder weather, and yes I even look forward to snow. Another more practical side to the colder weather is the use of the outdoor refrigeration. I made a big pot of soup tonight and, after having just gone to the grocery store yesterday, we had very little room to store the left overs. So, the remainder of the soup went outside on the back patio. The temperatures are dipping below freezing at night and only in the 40's during the day, so for most of the food that I fix, those temps will do just fine for the overflow. But I daresay, that the patio soup won't even make it long enough to see the upper 40's that we are expecting tomorrow, instead it will be Dave's lunch. For years now I have been trying to improve our way of eating. Throughout the years we have steadily improved our diet. First it was because I was learning about vegetarianism to help Jenn have a healthy and nutritional diet, then it was because as we grew older, the weight grew along with us. Then my cholesterol was borderline high due to genetics,but I figured surely I can do better.. and I have. But when I was diagnosed with breast cancer in 2009 my research led me down a more committed path to eating the way God intended us to eat. I could get on a soapbox at this point, but I won't. However we have taken that next step in becoming even more conscience of what we put in our bodies. This week, due to my lack of neglect of taking care of me, I came down with a cold. However, I am already feeling better and I have to contribute the speedy recovery to increasingly eating better each year. Yesterday came and went and I did not sit down to journal my daily thanks. I was busy until late in the evening and by the time I got home I was exhausted and not feeling 100%. This week my body was giving me fair warning to slow down or else. This morning when I woke up I realized my body wasn't bluffing. If I had just heeded my body's warning and did what I knew I should have done, such as rest more, drink plenty of water, and eat right, I wouldn't be experiencing these consequences now. But, it was my choice to not heed my body's warning. My bad. Today was a beautiful day in NE Ohio so Dave and I took advantage of the good weather and went to Kendall Lake to hike the trails. The air was slightly cool but the hike up the hills kept us warm. During our three hour hike, we stopped occasionally to look at a squirrel or chipmunk and a pileated woodpecker teased us with his calls, taunting us to find him in the thick forest. We never did. We saw several Canada geese on the lake and a hawk screeched high up in the air as he circled overhead looking for prey. We found a few fallen walnuts from some large walnut trees and several acorns. Dave said they fell from acorn trees. I pointed out that they fell from oak trees, but he insisted that if walnuts fell from walnut trees, then acorns fell from acorn trees. We both smirked at the joke. Dave travels frequently and whenever he comes back he always says, " It's good to be back home." Merriam Webster dictionary defines the word home as a familiar or usual setting. I have been very busy this week and just tonight helped assist at a large wedding. When I came home tonight, I felt that same contentment at being home. We have moved several times in the almost 30 years we've been married, so I believe home is not just the physical building we reside in, but the familiar setting we count on. Dave and I count on each other being there when we return. We can be free and easy with each other just being "ourselves" in each other's presence, communicating without even speaking. You've heard the saying "Home is where your heart is." Well, my home is wherever Dave is. This week has been a hectic and busy week and will continue into next week before I get the chance to regroup at home. But today.... ahhh, I had today. I was able to wake without an alarm, stay in my jammies for awhile and make a vegetable soup using just about every fresh veggie we had in the house. I took time to leaf through a magazine and have conversations with two of my good friends. I am thankful for a day of rest for my physical body as well as my mind. I started my day out helping someone de-clutter their home. Before I left we chopped vegetables together and I showed her how quick and easy it was to make soup with those veggies, some basil pesto and water. This afternoon I baked for the fundraiser I've been working on. Tonight was the fundraiser. It was a lot of hard work, but so satisfying to be able to help raise money for the Muscular Dystrophy Association to help find a cure to this awful disease. My nephew has this nasty disease and he is praying they find a cure. We're all praying for a cure. About this time 3years ago I was not in a place to physically help anyone as I was still weak after going through chemotherapy. I was the one who experienced others helping me, and the outpouring of love from family and friends. Today I am thankful for the physical strength and energy that I have now, so that I can pay if forward to others. I have been working on a fundraiser for my brother for the Muscular Dystrophy Association. In this process, many folks have offered to donate their time, gift, talents and baked goods so that we can raise money for this wonderful cause. I have been blessed to witness so much goodness come from people during this process. I am thankful for people who have BIG hearts! The first Sunday of each month Harvest church serves communion. During the time that the sacraments are being shared to the congregation, reflection and prayer is encouraged. This morning I had an understanding of the phrase, "If you aren't for Me, you are against Me." It hit me. We were God's enemy, yet He loved us so much, He sent his son to die as the sacrifice for our sins so that we might be saved from eternal death. We just spent the evening at our daughter and son-in-law's apartment. They had a housewarming get together with their friends where they served root beer floats and had tons of games to play. Our kids have a really good core group of friends who accept Dave and I as Mama and Papa. We are never made to feel like we are interfering parents and often have stimulating conversations with them, or challenging chess games as was the case tonight. I am even Nana to the little ones that are begining appear in the group now as well. I am thankful that our kids have God-loving, parent accepting, loyal friends. I am thankful that I have many friends who stand by me and support me. Your support means so much to me in so many ways. I cannot begin to express my thanks. I love all my friends both close and far away. November 1st! I am always amazed at how fast a year can seem to pass by. Today the sun shone. It may not seem like a big deal, but we haven't seen the sun shine for over a week. I am so very thankful the sun shone today.